The gathering of automobilists on New Years Day at Brooklands has established itself as the opening highlight of Britain’s classical motoring calendar. 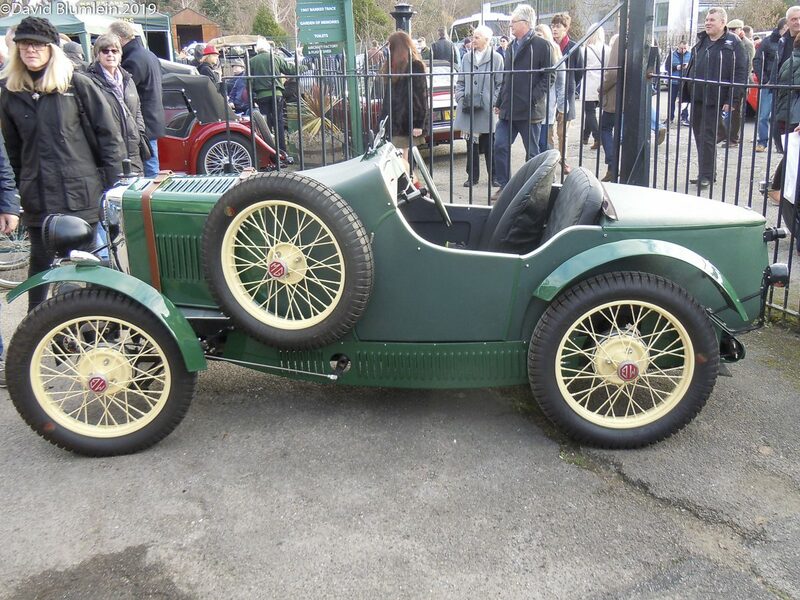 It being the first day of the year helps but the event has grown in popularity as the Brooklands site has been redeveloped to reflect some of the past glories. Our Special Correspondent braved the conditions and a few rather dull exhibits to bring us this first dispatch from the 2019 Motoring Front. First in the line of small sports cars that quickly gave the company its international reputation, the “M” type M.G. Midget was based on the newly introduced (in 1928) Morris Minor and shared with it the excellent Wolseley-designed overhead camshaft engine. This car is an early Oxford-built example (before the final move to Abingdon) and has the central throttle pedal and transmission brake. 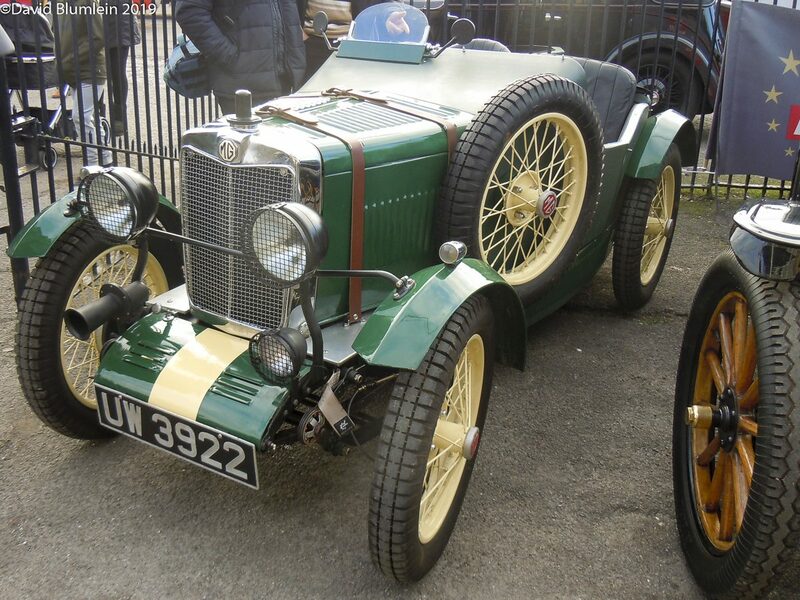 It has Brooklands racing history and is equipped like the two cars that ran at Le Mans and Spa in 1930. The pioneering Lanchester company amalgamated with Daimler in 1931 and this co-incided with Daimler casting aside their sleeve-valve engines (which they had used since 1908) and resorting to the use of poppet valves. In 1931 an interim Lanchester model, the 15/18, was introduced using the Daimler fluid flywheel and an example won the first R.A.C. Rally in 1932. 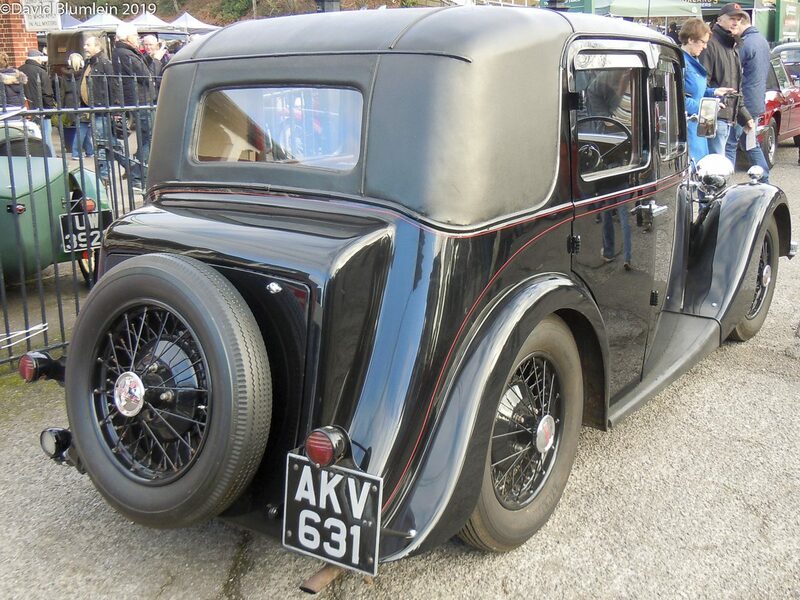 In October 1932 a completely new design was announced with a 6-cylinder ohv engine and the Lanchester cars were increasingly “Daimlerised”, this example having a 1378 c.c. 6-cylinder driving through a fluid flywheel and bodywork by Mulliners of Birmingham. 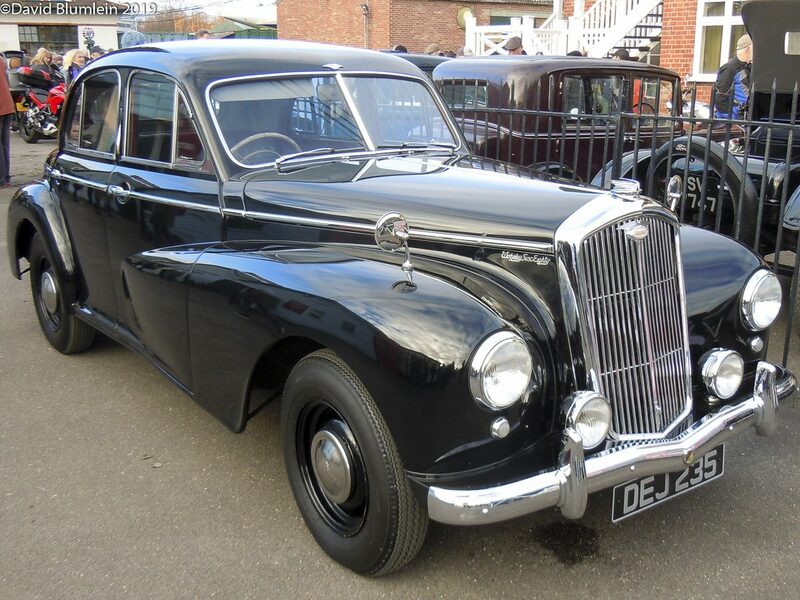 For Britain’s first post-war Motor Show in 1948 the Nuffield Group introduced a completely new range of Morris and Wolseley cars, quite unlike anything to emerge from their factories before. The Issigonis-designed Morris Minor was one of the Earls Court stars but two new Wolseleys were there as well: the 4-cylinder 4/50 and the bigger 6-cylinder 6/80. 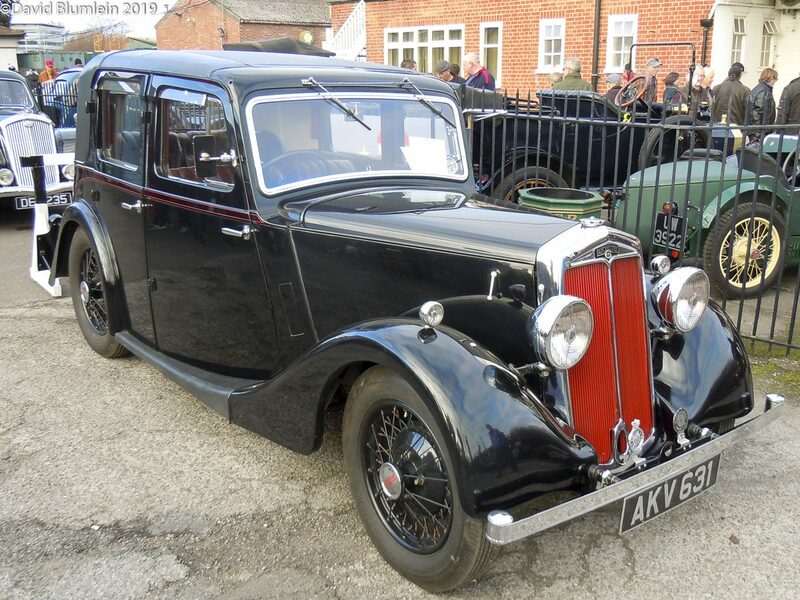 These both had, in the best Wolseley tradition, overhead camshaft engines (the 6-cylinder shared with the new Morris Six) and they were the first Wolseleys to have independent front suspension, this being an adaption of the Issigonis wishbone and torsion bar design. And steering-column gear changes, all the fashion at the time, were also new for Nuffield. They were not sporting cars, although some private owners turned up for the Monte Carlo Rally for a few years, and the Police chose them in quantity as Patrol cars. The car shown is a typical 6/80 saloon. In July 1937 Lord Austin introduced to the Press at Longbridge the Big Seven. This was a supplementary model to the famous Seven and had a longer chassis and an engine of 900 c.c. It was intended to bridge the gap between the Seven and the Ten. It turned out not to be a best seller and production stopped on 1939 when it was replaced by the Leonard Lord-inspired Eight which became a real success. 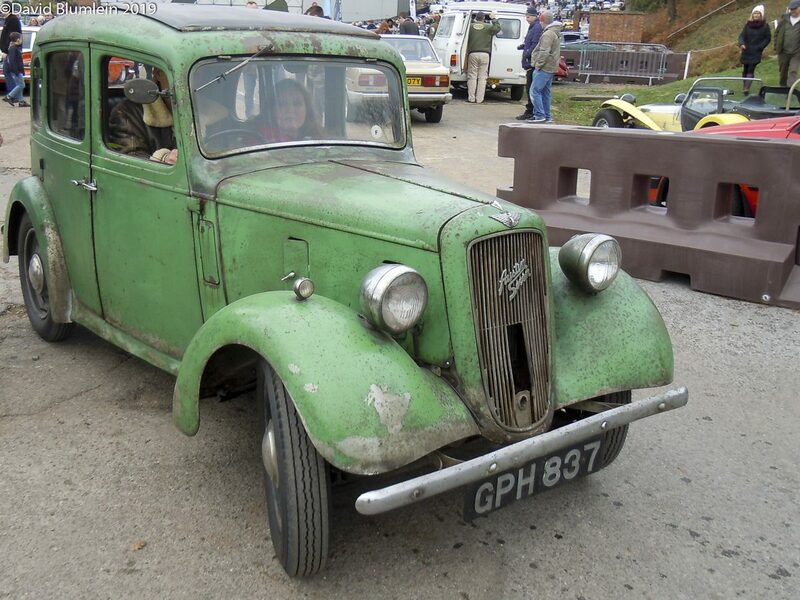 The Big Seven did compete on a small scale, four works cars, for example, taking premier awards in the 1939 Exeter Trial. This entry was posted in From A Special Correspondent, Nostalgia and tagged Austin Big Seven, Brooklands, Lanchester 15/18, MG Midget, Wolseley 6/80 on February 10, 2019 by John Brooks.